The Silk Route connected Cathay (the romanticised name for China) with the civilizations of the Indians, Persians, Arabs, the Europeans and everything in between. But we will focus on the Trade routes over the Himalayas and its adjoining ranges that formed thebasis of this trade. The main cities in Central Asia which served as the great transit points on the Silk Road were the great cities of Bukhara and Samarkand in West Turkestan (It used to be called Turkestan in those times) and the cities of Kashgar, Yarkand and Hotan on the Eastern side of Turkestan. From both Bukhara and Samarkand there were well established routes over the low passes of the Hindu Kush that led into Afghanistan and from there hence to India over the Khyber Pass. But the political divides and differences between the different Khanates and the political turmoil in Afghanistan and on the whole unsettled situation casued some of the Trade to shift further East. In the present Indian territorial context both Kargil and Leh were important trading towns on the Journey upnorth over what was probably the “Worst Trade Route in the World”. Kargil was equidistant from Srinagar and Leh and also served as a gateway to Gilgit Baltistan and the town of Skardu and further North West. There was a trade route from there as well which followed what is now the Karakoram Highway over the Khunjerab Pass into Turkestan and the town of Tashkurgan. 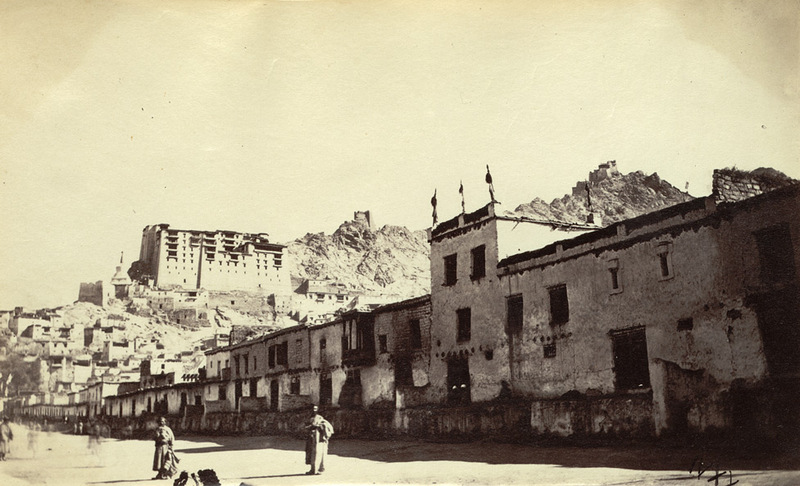 Coming to Leh, it served as the great bazaar as traders of all hues and colors could be found there. Leh was the point of convergence of various trade routes coming from different directions and as such was the epicenter of all the trading that went on, on this route. Unlike the touristy place it has become now it was a great center of trade where traders from Kashmir, Punjab, Yarkand, Central Asia, Tibet, Persia converged and goods, services and ideas were exchanged. As rightly pointed out by Kaushik Shil Sir in reply to my previous post the bulk of the trade from the plains of India came up through the Srinagar Zoji La Leh trade route. However there were other caravan routes also which bought in goods. From Skardu side there was a route through Khaplu and over the Chorbat La into the Nubra Valley and onto Leh over the Khardung La. Also there was another route along the Indus Valley. From Kishtwar there was a route over the Umasi La into Zanskar and then onto Leh from there on. From Kullu it was over the Rohtang La into Lahaul and then over the Baralacha La onto Leh. The fact that this Route went over the Baralacha La I have confirmed with many references including the documented travel of the Himalayan exploration pioneer, Moorcroft who went over the same route from Kullu and became probably the first Englishman to visit Leh. However the Route they took once they descended the Bara Lacha La and then onto Leh is something I am still working on though Im pretty sure that they followed somewhere close to where the present day road runs. This Route was encouraged by the British as it somehow allowed them more leverage in the trading rather than paying the heavy duties which were imposed on the traditional Srinagar Zoji La by the Sikhs and later on the Dogras. Infact the British also tried the trading directly with Yarkand over the Chang La Pass, thus avoiding Leh which was under Sikh/ Dogra control. But the Route took them over the Depsang and the Changchenmo which was just devoid of any greenery or pastures and there was hardly any inhabitation for most of the Route. From Spiti one route took you over the Parang La into Rupshu in Ladakh and then onto Leh.Further afield from Nurpur and Bushahr there was apparently a route throung the Long Lacha Pass and Thung Lung La (both these Passes have gone into obscurity from what I know). If anyone knows about them please update me. In my view all trade from these areas has now stopped so these Passes lay forgotten and are unused as such. Also maybe access to these areas are noe restricted because of present day boundary disputes. 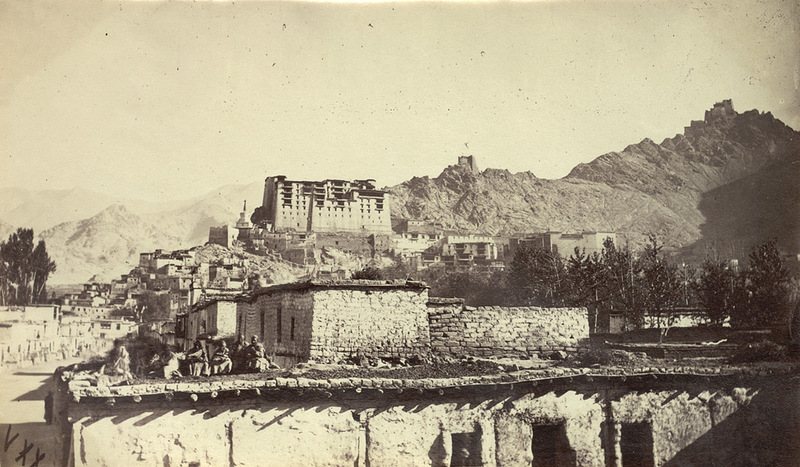 To the east of Ladakh there was the town of Gartok from which a Route led to Lhasa as well. Ladakh for all practical purposes is a part of Tibet so there was a constant flow of traders and pilgrims on this Route. I also imagine that some Chinese goods also came into Leh by the way of this route from Tibet central. 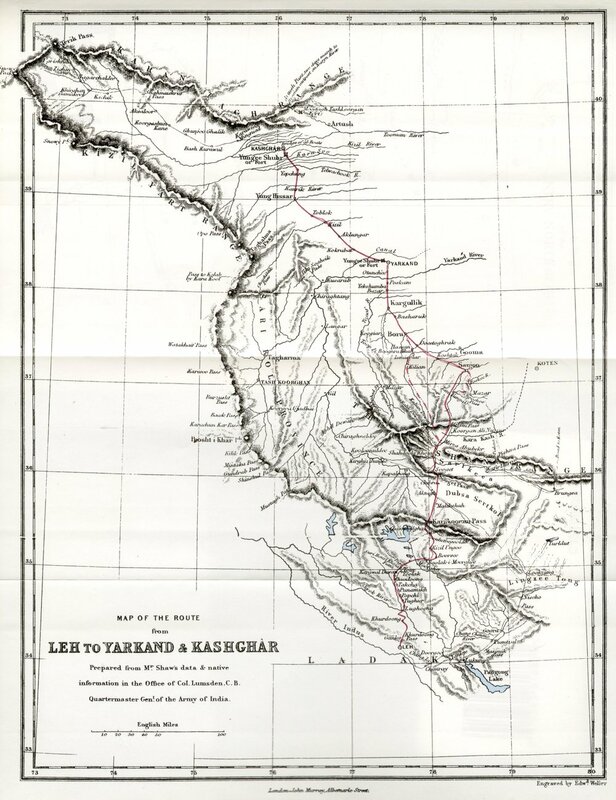 And of course to the north of Leh stood the route to Yarkand which has been discussed in detail in a previous post. Interestingly besides that Route there were two other Routes to get to Yarkand. One Route only available in the winters was crossing the Digar La into Nubra (an alternative to the world famous Khardung La) and then walking the narrow gorges of the frozen Shyok River to the Karakoram Pass and then moving on along the Classical Leh Yarkand route. Sort of like a Chadar trade route only that now its virtually impossible. Another route as described before was through the Changchenmo and Linzithang plains over the Chang La to meet the existing classical route at Shahidulla. Coming to a stop for now it is indeed a misfortune that in today’s day and age most of these areas are again off limits and will remain so for a long time it seems. Till then we can just read the accounts of the travels and try and get a feeling of what it felt like. When I again get over my laziness I will write a long one on The Treaty Road between Srinagar and Yarkand. References : Again John Keays When Mountains and Men Meet : Explorers of the Western Himalayas. And a bigger reference for this is Himalayan Frontiers of India by K Warikoo. This was one of the basic source of the information used.